Known as a hybrid of trouts, Tiger Trout is considered one of many special types of fish that a fisherman can get his hands on. A Tiger trout is actually a combination of two species of trouts. They are also the aggressive type and that is why anglers and fishermen would take on the challenge of baiting one. This article will discuss the tips and tricks you can use on fishing Tiger trouts. Additionally, we will also dive deep and discuss all you need to know about this powerful hybrid. Where Can You Usually Find Them? How To Catch Tiger Trout? The Tiger Trout is known to be an anomaly of the wild since it is a cross that came from two types of trout from different genera. It is an inter genetic hybrid from a brown trout, known scientifically as Salmon Trutta and the brook trout which is scientifically known as Salvelinus Fontinallis. This breed goes as far back as 1944. 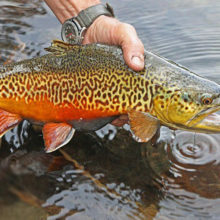 The unusual pairing of the brook trout and brown trout resulted in a trout that resembles stripes that of a tiger, thus it is referred to as the Tiger Trout. They have also been found to grow faster than any other natural species. Tiger trouts are usually bred and raised in fish farms only to be released later on to help control the competition. This is also the reason why the Tiger Trout has become a go-to breed used for fish stocking programs. The process of breeding Tiger Trouts happens through the fertilization of the eggs from the brown trout and the milt of the brook trout. It results in the Tiger trout having an excess number of chromosomes and an enhanced survival rate of about 85%. This type of trout is considered a very piscivorous which means it feeds heavily on other fishes. The average weight can be around 2 to 5 pounds, however, there had been records of the largest being at around 20 pounds. As the name suggests, Tiger Trouts are famously known for their tiger stripes. They usually appear grayish-brown in color with their body covered in a labyrinth-like pattern. They also typically have a bright colored belly often seen as a yellow and orange blend. They carry a square tail fin and their pectoral and pelvic fin displays the same color as their belly. Meanwhile, their head will usually have a spotted pattern which is similar to that of the brown trout. The females will usually have a light brown and tan shade with less of the orange and yellow tones. Tiger Trout don’t naturally appear in waters, and they are actually released into lakes after they are bred and raised in fish farms. The places with abundant Tiger Trout population include Utah, Colorado, Wyoming, Indiana, Minnesota, Ohio, Nevada and Saskatchewan, Canada to name a few. Often times, they thrive in cold waters and big lakes. However, there is also a huge population that can be found in moving waters. Tiger Trouts are agile fishes and can easily swim against the current. Additionally, they are also found in waters where there are tons of small fishes. This powerful hybrid also has a very huge appetite. To keep up with their strength, they generally are feeders of other smaller fishes. Being piscivorous makes them the ideal weapon in controlling fish population. Aside from small fishes, they also have an appetite for invertebrates, insects, and larvae. Additionally, they also feed on nymphs, trout dries, and streamers on other occasions. One of the notable characteristics of a Tiger Trout is its strength. Most fishes save the nutrients they get from feeding for the purpose of reproduction. However, this is not the case for the Tiger Trout. Since they do not reproduce and reproduction is not on their primary purpose, most of the nutrients they consume is used for growth. This is mainly the reason why this breed possesses great strength and can put up a fight when caught. 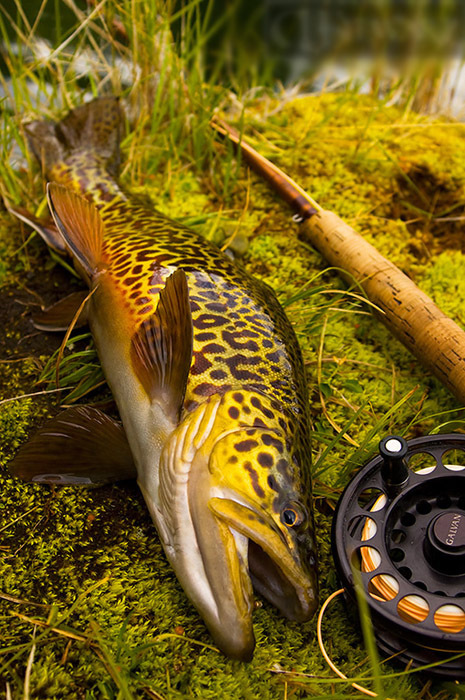 Tiger Trout are mysterious and can put up a fight when caught. This is the reason why anglers and fishermen consider it a priced catch. Among the most effective ways, there is bait casting and fly fishing. Baitcasting is one of the methods of fishing that you can explore and use to catch Tiger Trouts. This method relies on the lure’s weight to extend the fishing line to the target. Follow these steps to guide you on how to properly do bait casting. Hold your baitcasting rod above the waist level. The reel should be above the rod, and your thumbs should fall on the bottom of the spool. As for your lure or bait, it should be about 8 to 10 inches below the rod’s tip. While your thumb is on the spool to make sure that it does not unwind, put the reel into a free spool by pushing the button. The next step you need to do is to pull the rod backward so its tip will sweep over your dominant shoulder. After that proceed to bring it forward quickly. You have to make sure that while doing this the tip of the rod is aiming at the target. While the rod is coming forward, take your thumb off your spool. In doing so, you are allowing the lure to pull the line of the reel. Once you noticed that the lure touches the water, you need to again put your thumb back on the spool. To engage the anti-reverse, you can try to reel once or twice. After which, you are now ready to catch that priced Tiger Trout. Another method that you can opt to use is fly fishing. This method is commonly used to land monster sized trouts like the Tiger Trout. Here are the steps that you can follow on how to fly fish for Tiger Trouts. Before you can go ahead and try out your hand in fly fishing, first, you have to make sure that you have obtained the proper license in order for you to go fly fishing. Each state has their own requirements regarding this, so you need to check carefully. Next is to pick out the ideal flies. Flies are created to mimic aquatic invertebrates and can be purchased at any fishing stores or can also be made. The most common types include stonefly hatch, midges, leeches, dragonfly, and mayfly hatch. Once you have picked out your flies, you need to tie the fly knots properly to your line. Before tightening your fly knot, wet it first so it will be easier for you to slide the knot around your line and slide it into place. Once the fly knot is in position, you can tighten it. To check if it is securely in place, try to pull the line. If you notice any excess line at the end past your knot, cut it off. Be sure to cut off any excess line as close to the knot as possible. After you have securely tied your fly knot to your line, it's time to cast and reel your catch. You have two options in doing this depending on the available space you have around you. If in case you have more than enough room, you can opt to do a two-stroke cast. If you notice that there are no low hanging trees around you, then this method is very much possible. 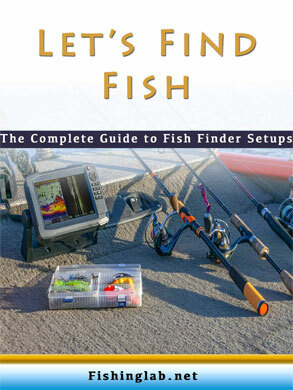 To start, let out around three rod-lengths of your fishing line. Keep your rod held by your dominant hand. Do a thorough check on your fishing line if there are any tangles. If you notice any tangles on your fishing line, be sure to fix and straighten them before casting. Have your arms slightly extended, and then with a steady movement, whip the rod tip up and back. Attentively observe the line unfurling. Before it straightens out, whip the rod forward. This will instantly send the line out to the surface of the water. However, if you are in a situation wherein you do not have enough space to do a two-stroke cast, you can do a roll cast instead. When doing a roll cast, position the rod slightly in front of you and hold it with your dominant hand. Before casting, check carefully for any tangles and be sure to straighten and fix them. Slightly move the rod backward. The tip of the rod should be positioned right above your casting shoulder with a little piece of line hanging behind you. Slowly bring the rod forward and then as your arm comes down, speed it up. Swiftly stop once the rod’s tip is slightly angled upward. In doing so, the loop will unfurl and land on the water’s surface. Next is to make your fly move on the surface of the water. Since Tiger Trouts have a big appetite for small fishes, insects, and invertebrate, you have to control the movement of your fly as if it is the real thing. You can let it drift without moving it or you can give it slight twitches that imitate a natural movement of insects and invertebrates. Once you feel a bite from the fish, it is time to hook it. If this is not done properly, you catch can easily get away. Keep the tip of the rod low on the water. This is important, so you can shift the tip of the rod in the direction of the curvature of the line. Once you have set the hook into the fish’s mouth securely, you need to make sure it is kept that way. With your dominant hand holding the rod, pull the line sharply using your other hand. Be careful not to yank the tip of the rod upwards. In case the fish tries to strike up, just keep the tip of the rod close to the water and directed toward the path of the line. Strip away the line until the fish gets tired. If you are pulling in a big fish like the Tiger Trout, you need palm your reel. To do this, you need to apply pressure to your reel using your palm, so the spool won’t run out. Once the fish is hooked in, its initial reaction is to fight. At this point, all you need to do is to wait until it gets tired. The moment it loses all its energy, you can now net your fish. Be sure to avoid lifting the rod up. It is ideal to keep the fish in the water especially if you want to release it afterward. If you have a bigger size fish like a Tiger Trout, it is best to lead it first in shallow waters. Position the net carefully and then start pulling the line and guide the fish into the rim of the net. If the fish’s body is past the rim of the net, gently lift it up out of the water. Once you have done that, you can start unhooking the fly from the mouth of the fish. Make sure that you do this as carefully as possible as the fish will surely be flailing during the process. This could cause harm to your part. After which you can decide whether to release it or not. Now that you have in-depth knowledge about the Tiger Trout including the effective way of fishing for it, we are throwing in some bonus tips on Tiger Trout fishing. Try fishing once the sun goes down or late in the evening. Tiger Trouts prefer cooler waters and fishing in the evening will be your best bet. Additionally, it is easier to land Tiger Trouts in shallow waters during the night. If you will be using a pontoon boat or a float tube, it is best to use a floating line. You can move the bait across the water’s surface for it to look like a moving insect. Tiger Trouts are very fond of mosquitoes, flying ants, and midges. A wet fly paired with a sinking line is ideal if you are fishing in deep waters. Knowing which flies are most effective to use. In situations where the Tiger Trout is active, an olive or black mid-sized Woolly Buggers if perfect. Additionally, you can also opt to use a size 12 or 14 water boatman imitations, backswimmers or midnight fire and psychedelic P-quad. On the other hand, during the summer season when Tiger Trouts are resting at the bottom, you can use ones with chironomid patterns like a snow cone, red, maroon, and black-and-silver. This is also the time when insects are hatching which makes it an ideal cover. Aside from knowing which flies to use, you also need to assess which lures you can go for. When it comes to using lures, most anglers and fishermen opt for floating Rapalas that are small in size. The ones with the perch pattern, silver colored, and gold are the best for this job. These are typically used when the Tiger Trout is wandering in shallow waters. Meanwhile, for triggering Tiger Trout that frequently stay in deep waters, you can use small jig heads that are tipped with chartreuse or olive twister tails. In addition, small red and yellow spoons and little Cleo can also do the trick. Know when is the right season to fish for Tiger Trouts. This will make it easier for you to spot Tiger Trouts and catch them. The best season will generally be during the spring and fall. The hot environmental conditions force Tiger Trouts down the water column that makes them slow and inactive. Consequently, during the early spring, they usually come together in shallow waters. This often results in a rise in the numbers that you can catch. In case you are planning to fish for Tiger Trout during the winter season, it is very doable. However, you need to consider some things before doing so to avoid any time and efforts being wasted. You need to wait until “ice off” for you to fish for Tiger Trout during the cold weather. During the specific time, the ice starts to melt, the sky is clear, and the wind is calm. This will take no longer than one to two weeks and this is the time when the water will start to warm up. As a result from this, the Tiger Trout and other fishes will start moving away from the shore. This is why you need to keep track of the weather conditions if you want to take advantage of the “ice off” period. During this period, you need to be very patient as the Tiger Trout would typically cruise in schools every now and then along the shoreline. The baits that are best to use during ice off fishing are Nightcrawlers and PowerBaits. Combine this with using a large sinker and let your bait sink to the bottom. For flies and lures, the ideal one to use is something that looks like a leech. Opt for tube jigs and grubs that have a dark color. To make it even more effective, you can try to coat it with Smelly Jelly or another scent that can attract a Tiger Trout. You can also place a Nightcrawler on the lure’s hook, especially if you are using a plastic lure. There is a tendency that the Tiger Trout will strike the lure again if there is a scent to it. This will eventually give you more chance of definitely hooking a Tiger Trout. In summary, Tiger Trouts are one of the most sought after fishes that anglers and fishermen are usually after. This special breed of trout is a genius combination that results from crossing a brown trout and a brook trout. It is also often used for fish stocking programs and for sports fishing. There are several ways and techniques that you can use to fish for Tiger Trouts. Consequently, you can also learn and master the tips that we have discussed in this article. With an in-depth knowledge about Tiger Trouts and understanding of these methods and techniques, you are now ready for a fishing expedition, unlike what you may have had before.